The current climate on Mars does not allow for significant accumulations of surface ice at low latitudes. Therefore ice is only found at the two polar ice caps and in a number of ice-filled craters scattered at northern and southern latitudes (> 70°). Image 1 : Extent of Late Noachian – Early Hesperian glaciation and location of supraglacial landslides in Valles Marineris (Gourronc et al., 2014). Theoretical considerations on the stability of water ice and climate numerical simulations however predict that surface ice accumulation areas may have shifted repeatedly between high and low latitudes in the past, in response to changes in Martian orbital and atmospheric characteristics (Forget et al., 2006 ; Wordsworth et al., 2013). Observational evidence of past glaciations has also been described at Martian polar to tropical latitudes (Kargel and Strom, 1992). These include currently debris-covered glaciers and landforms interpreted as remnants of extensive glacial landsystems. All these glacial landforms are thought to be related to Amazonian (< 3 Ga old) cold-based glaciations (Dickson et al., 2008; Head et al., 2010). 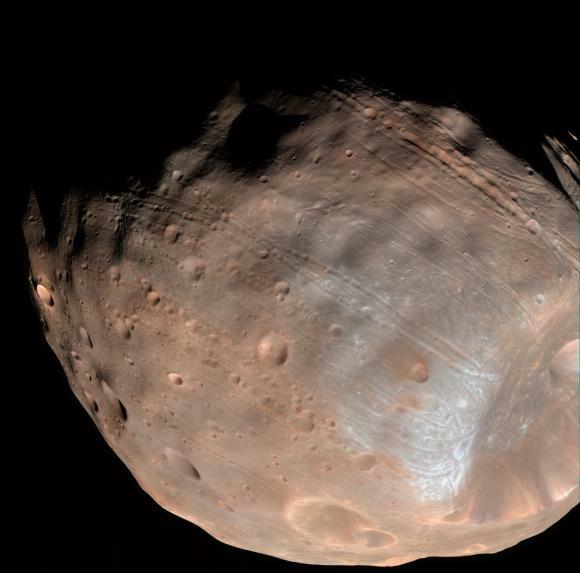 However, little morphological evidence of past glacial activity has been described in the equatorial regions of Mars. A reapraisal and cartographic compilation of landforms in Valles Marineris (Gourronc et al., 2014) has revealed that this giant valley system that stretches over 2000 km along the martian equator, was entirely covered by a wet-based glaciated valley system during Late Noachian to Early Hesperian times, 3.5 Gy ago, and still contains huge volumes of fossil ice inherited from this ancient glaciation (Image 1). This supports the idea that massive wet-based ice deposits have formed at the Martian equator during the Late Noachian or Early Hesperian and have been preserved for their larger part until the present day. 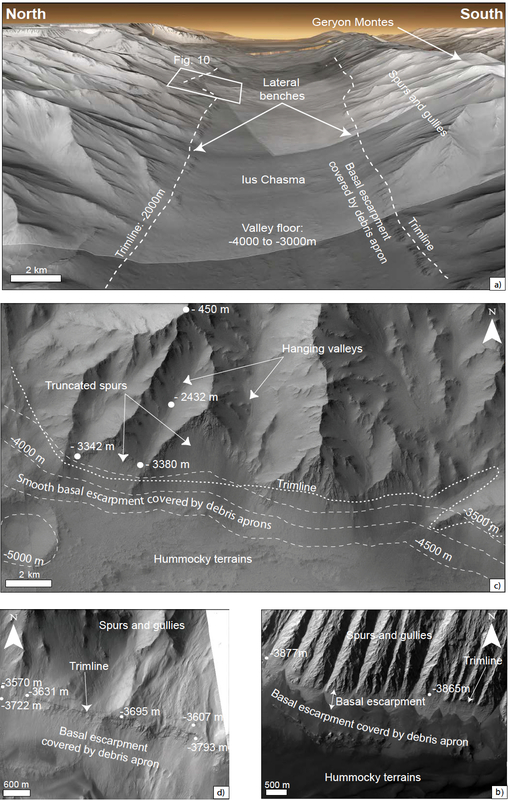 Image 2 : Examples of glacial landforms along Valles Marineris valley walls (Gourronc et al., 2014). (A ) Perspective view looking eastward along Northern Ius Chasma, showing trimlines, basal escarpments, lateral benches, truncated spurs and hanging valleys (view produced with Google Mars from mosaic of CTX images and MOLA gridded elevation data). (B ) Trimline (white dotted line), basal escarpment, hanging valleys and truncated spurs at the base of basement wallrock in Coprates Chasma (CTX image). Elevation contours (thin white dashed lines) derived from MOLA gridded elevation data. (C ) Trimline and basal escarpment covered by debris apron at the base of basement wallrock in Coprates Chasma (CTX image). (D ) Trimline and basal escarpment partly covered by debris apron at the base of an ILD mound in central Candor Chasma (CTX image). On (A) – (D), white dots indicate elevations derived from MOLA PEDR single tracks at selected representative locations. The upper parts of valley walls in Valles Marineris display a spur-and-gully morphology typical of terrestrial periglacial environments, whereas their lower parts generally comprise smooth basal escarpments resembling glacially trimmed surfaces. 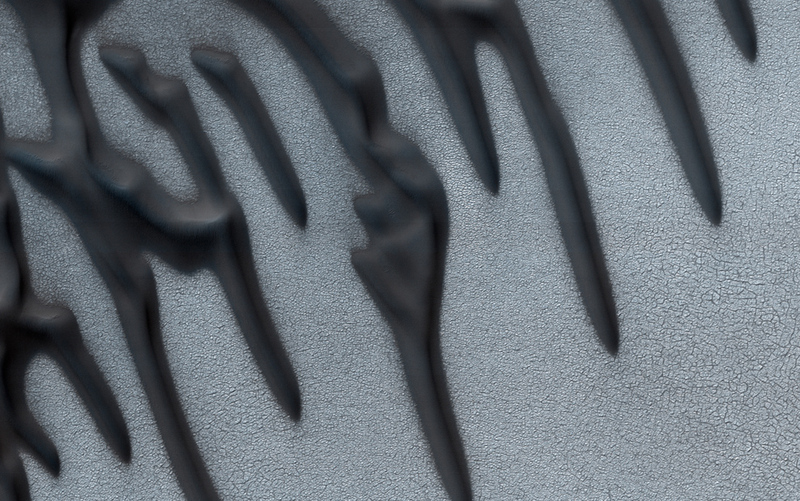 Mège and Bourgeois (2011) interpreted the contact between these two distinct morphologies as a glacial trimline, i.e. a morphological boundary marking the maximal elevation of an ancient glacial fill. The morphological boundary has been spectacularly preserved along valley walls and stands several hundreds to several thousands meters above valley floors (Image 2). It winds around topographic obstacles and displays long-wavelength variations in elevation. This boundary is underlined by lateral benches, hanging valleys and truncated spurs, which are diagnostic landforms of glaciated valley margins. Valles Marineris valley floors are covered by various kinds of terrains, including hummocky terrains, platy terrains, lateral banks, layered benches and a draping mantle (Image 3). 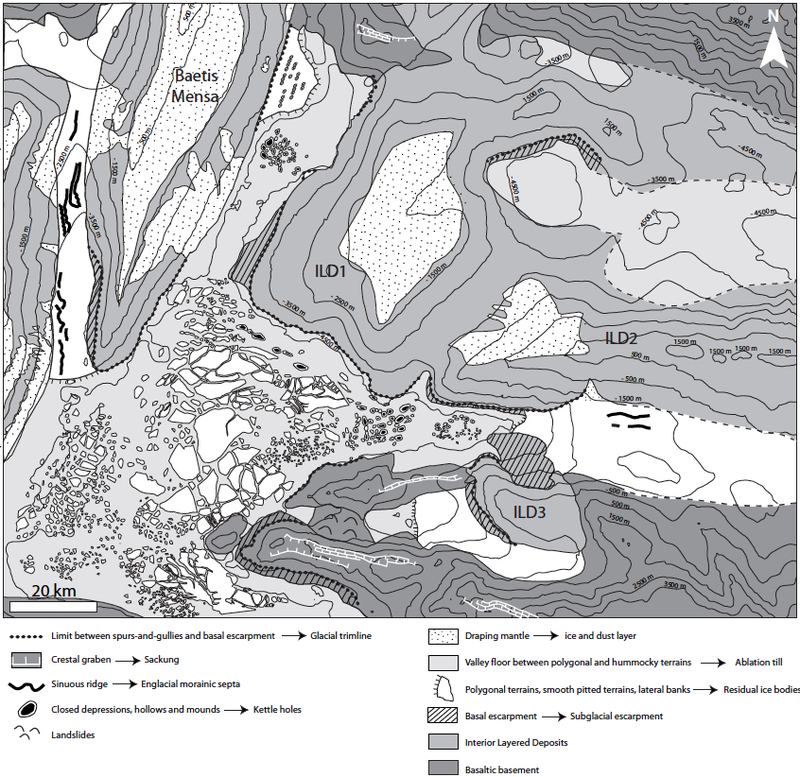 Sublimation landforms observed in these terrains and their cartographic relationships with the interpreted trimline suggest that all these terrains correspond to various disintegration stages of a fossil glacial fill, currently protected by a superficial cover of ablation till (Image 3). Image 3 : Geomorphological map of central Candor Chasma, based on interpretation of CTX images, THEMIS daytime IR images, gridded MOLA elevation data, and MOLA PEDR single track elevation data (Gourronc et al., 2014). Numbered elevation contours (thin black lines) derived from gridded MOLA elevation data. Partial disintegration of the Valles Marineris glaciated valley system caused gravitational spreading of the intervening rocky basement ridges, thus leading to the development of sackung, crestal grabens and uphill-facing fault scarps on basement ridges (Image 4, Mège and Bourgeois, 2011). In some instances, paraglacial collapse of rocky basement ridges triggered giant landslides (Image 1). These landslides have singular morphologies, unexpectedly long runout distances, and cover unexpectedly wide areas comprised in the range between those of dry subaerial landslides and those of wet submarine. All these characteristics are consistent with the hypothesis that the landslides were emplaced supraglacially (De Blasio, 2011), over fossil ice bodies that have been preserved on Valles Marineris valley floors until the present day. 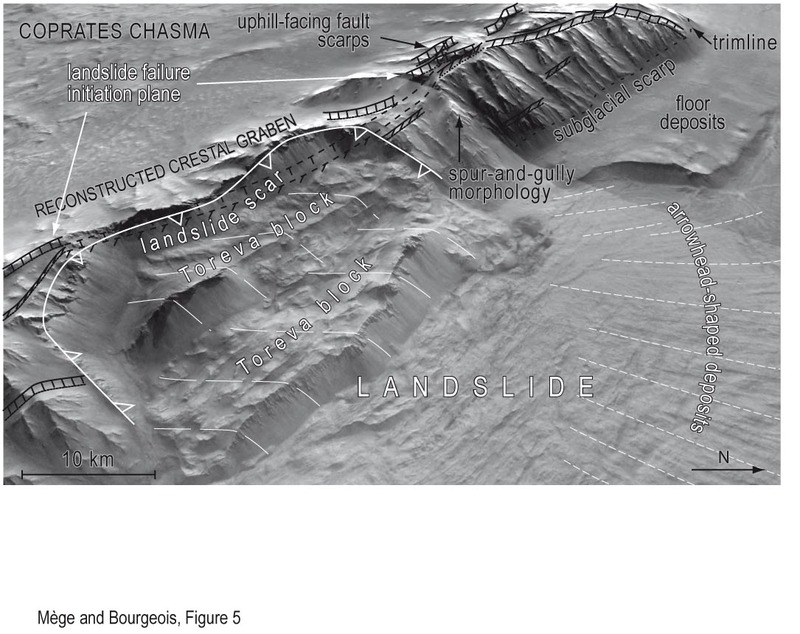 Image 4 : Perspective view of paraglacial mass-wasting processes (sackung and landslides) in Coprates Chasma (Mège and Bourgeois, 2011). Sackung-related tectonic structures and glacial morphology are shown in black and landslide-related structures in white. The landslide scar is aligned with the uphill-facing normal fault scarps of the sackung crestal graben (THEMIS image mosaic draped over HRSC digital elevation model). Morphological characteristics of the landslide debris apron (arrow shape, radial lineations, long runout distance) are consistent with supraglacial emplacement (De Blasio, 2011). Altogether, landforms and terrains in Valles Marineris thus compose a full glacial landsystem, consistent with the former presence of wet-based glaciers, as thick as 1000 to 3000 m, that were able to flow and slide over their beds. This glacial system was most probably fed by ice accumulating at low elevations directly from the atmosphere onto valley floors and walls, with only minor contributions from tributary glaciers flowing down from higher elevations. 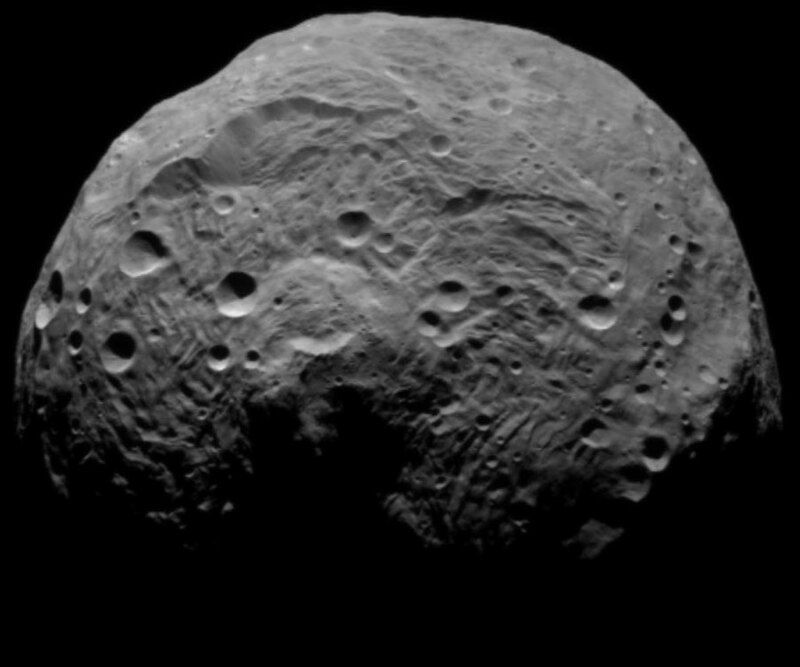 Similar fossil glacial landsystems dating back from the early Martian history are to be expected in many other low-latitude troughs such as chasmata, chaos, valleys, impact craters and other basins. De Blasio, F. V., 2011. Landslides in Valles Marineris (Mars): A possible role of basal lubrication by sub-surface ice. Planet. Space Sci. 59, 1384-1392. Dickson, J. L., Head, J.W., Marchant, D.R., 2008. Late Amazonian glaciation at the dichotomy boundary on Mars: Evidence for glacial thickness maxima and multiple glacial phases. Geology 36, 411-414. Forget, F., Haberle, R.M., Montmessin, F., Levrard, B., Head, J.W., 2006. Formation of glaciers on Mars by atmospheric precipitation at high obliquity. Science 311, 368-371. Head, J. W., Marchant, D.R., Dickson, J.L., Kress, A.M., Baker, D.M., 2010. Northern mid-latitude glaciation in the Late Amazonian period of Mars: Criteria for the recognition of debris-covered glacier and valley glacier landsystem deposits. Earth Planet. Sci. Lett. 294, 306-320. Kargel, J. S., Strom, R.G., 1992. Ancient glaciation on Mars. Geology 20, 3-7. Mège, D., Bourgeois, O., 2011. Equatorial glaciations on Mars revealed by gravitational collapse of Valles Marineris wallslopes. Earth Planet. Sci. Lett. 310, 182-191. Wordsworth, R., Forget, F., Millour, E., Head, J.W., Madeleine, J.-B., Charnay, B., 2013. Global modelling of the early Martian climate under a denser CO2 atmosphere: Water cycle and ice evolution. Icarus 222, 1-19. Is the Xanadu region on Titan an impact basin? Really interesting article on Mary Bourke’s Planetary Geomorphology image of the month blogsite by Bourgeoi et al. on possible ancient (3.5 Gy) glacial features in the Valles Marineris, Mars, including an image of a stunning landslide where runout length may reflect basal ice.